London, a city located on the banks of the Thames river is the capital and most populous city of England. Full of vast history and culture, the Royal city is certainly on the bucket list of every traveler. As they say, the real culture of a city can only be experienced from its food cuisines. Therefore, between the hustle and bustle of this “City of Golden Times”, you should also discover the nearby market places and street food stalls to experience the vast culture and cuisine that London has to offer. A little tip: hiring a car in London is much more convenient way to get around and visit all the places, listed below, than it might look. Eat my Pies: This incredible food stall at the Sunday Upmarket at the Old Truman Brewery is a bliss. It offers the quintessential British cuisine. 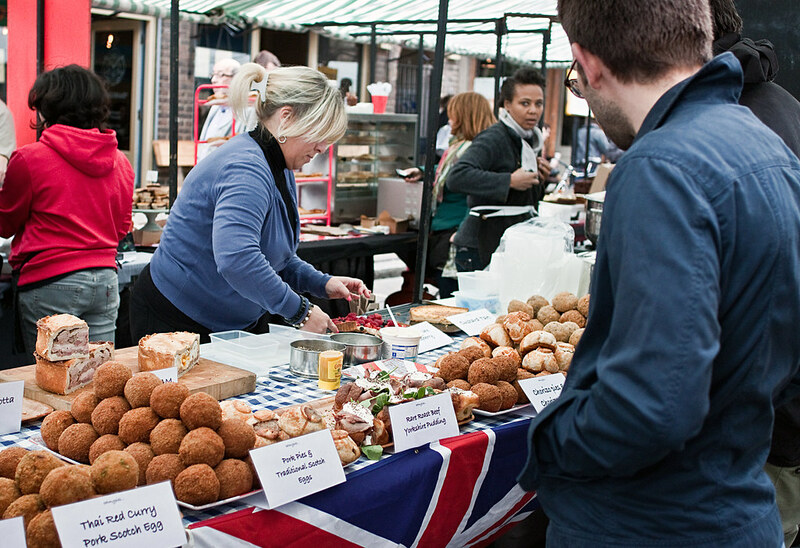 Some of the “Must Haves” are scotch eggs, pork pies and custard tarts. If you’re already drooling over the fancy names then there is another dish known as “Chorizo pie” which is the icing on the cake. Red velvet cupcakes, cinnamon buns and Yorkshire pudding will make your day. Kimchi Cult: This little place is surreal as it unifies Korea with Britain. Kimichi Cult (translates to Burgers with Korean toppings) is known for its Korean fast food delicacies. This korean food stall is dynamic and changes its location. It can be found at weekday market at Kerb Kings Cross, King’s Boulevard; Friday nights at The Street Feast night market and on Sundays at The Chatsworth Road market. You must gave a go at the exquisite Kimich Cult Special Burger which will make you crave for it more and more. 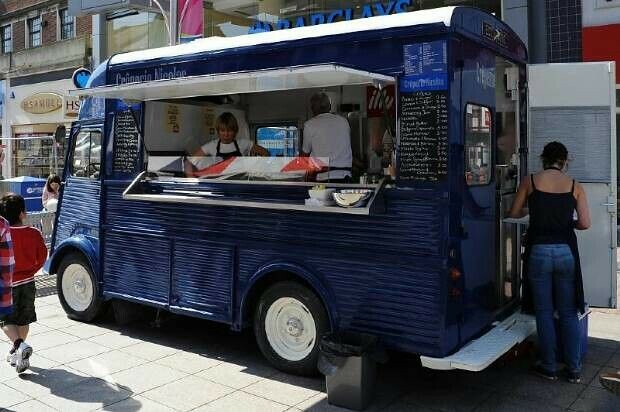 Crêperie Nicolas: Located in the Southbank Centre Food market; this stall offers the traditional food hosted by passionate couple. The savoury galettes comprising of organic buckwheat flour, the brie, bacon and mushroom fills your heart with joy, while the sweet crêpes use a vanilla-flavoured batter. The authentic quality of Breton crêpe will make you fall in love with London. You can also have some fresh coffee offering a fine touch for a lazy breakfast. Churros Garcia: What can be more joyous than enjoying Spanish cuisine across the banks of Thames River. Having proven its mettle for over 40 years, this foodplace offers handmade Churros. Doughnuts with spanish chocolate dipping are ecstatic to have. 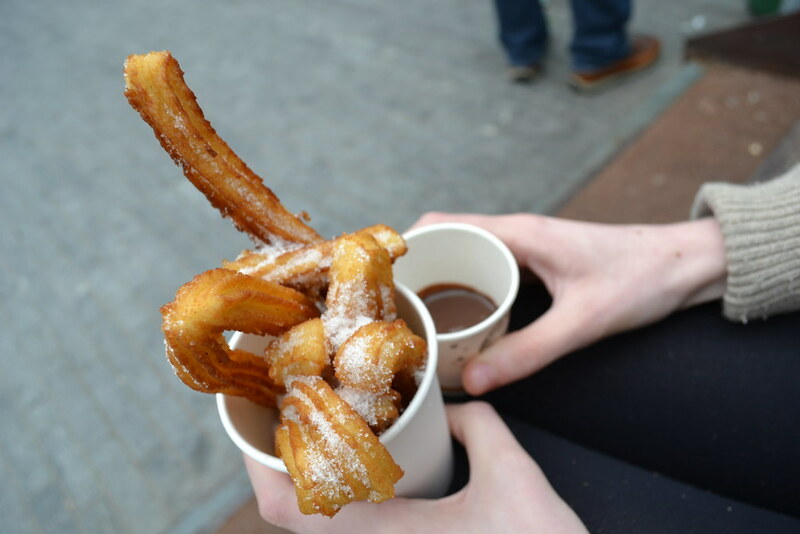 The Grub (Hot tubes of freshyl made crunch sweet dough with hot chocolate) and The Vibe (Fried Churros dipped in hot chocolate) are the most sought after delicacies. This eatery is located at Broad Way market, Real Food market and Portobello market. 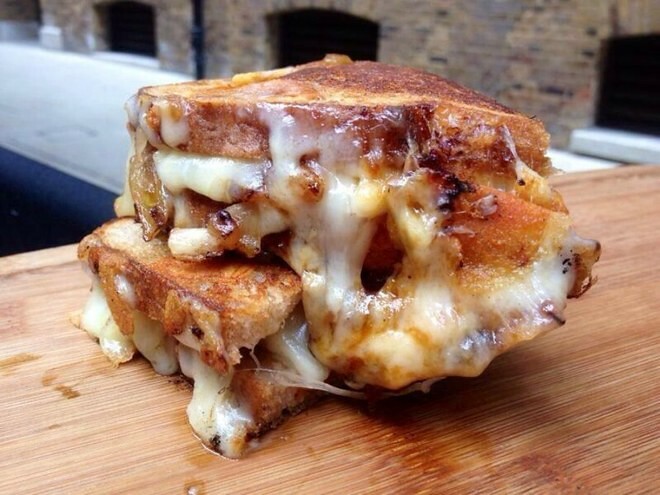 Grill My Cheese: It is Leather Lane market lunchtime stall which serves grilled cheese sandwiches on exotic organic sourdough bread. Famed for its “Rainbow Toastie”; the eatery ticks all the right notes. Rainbow toastie with dripping colorful cheese tastes as colorful as it sounds. Baby got mac; an explosion of cheese and macaroni are delicious. This must be on your to-do list while visiting London. The aforementioned places are gates for experiencing the diverse and rich cuisine of London. So feast your eyes with colorful and bold cuisine of London while experiencing the pristine history and good times.